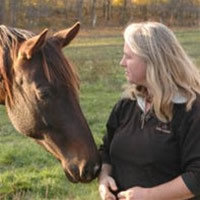 Sharon is both an experienced organization development professional and a skilled horse trainer. She has worked with companies to redesign their structures, change their cultures, improve their customer satisfaction and increase their operational effectiveness. Sharon has an extensive background in the design and delivery of management training programs in the areas of organizational change and innovation, leadership, human relations, group dynamics, management, organization design, appreciative inquiry, polarity analysis, organizational learning and organizational culture. Sharon is a leader and program innovator in the area of Equine Assisted Learning, a senior associate of Participative Designs Inc. – a Toronto, Canada based training, facilitation, and consulting group and the director of the Campbellville Leadership Centre. She has presented workshops for a International Association of Facilitators, the Association for Creative Change and Organizational Development and the Canadian Society for Training and Development.